The Russian Defense Ministry has wrapped up a stage of tests of the new multi-purpose anti-tank guided missile system Kornet-EM, which is capable of effectively engaging both ground and air targets, including difficult-to-detect-and-defeat helicopters and unmanned aerial vehicles, the newspaper Izvestia reported, referring to a source in the Ministry.Developed by the Tula Instrument Design Bureau, the Kornet-EM is designed to protect the S-400 missile system from enemy saboteurs, armored vehicles and drones during route marches. “The test stage was successfully completed, and the Tula system coped with all the tasks. We plan to wrap up the remaining test stages in the near future so that the Kornet-EM can be put into service,” the source said. Izvestia also quoted a spokesperson for the holding High-Precision Systems holding as saying that the Russian Aerospace Forces’ command had heaped praise on the Kornet-EM for taking part in a simulated military operation during a phase of Army Games earlier this month. 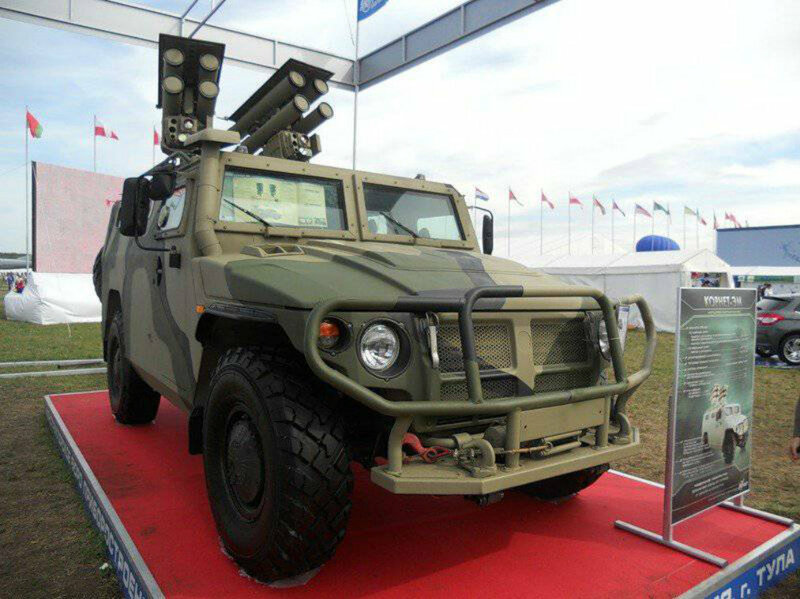 The Kornet-EM system, mounted on the Tigr armored vehicle’s chassis, was presented for the first time during the Victory Day Parade on Moscow’s Red Square on May 9, 2015. 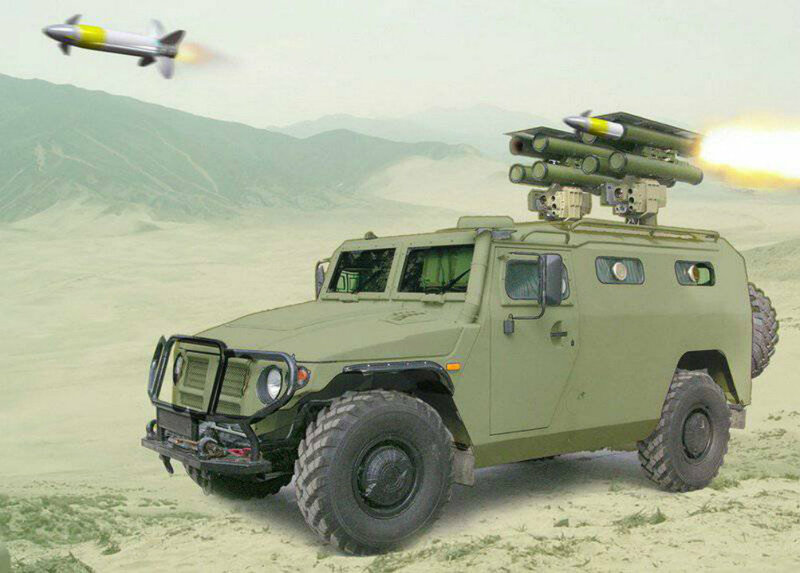 The difference between the latest model and ordinary armored vehicles can only be seen when two launchers with eight missiles, hidden in protective containers, rise from the vehicle’s body. In an interview with Izvestia, Dmitry Kornev, an editor of the website Militaryrussia, described the principle behind the Kornet-EM’s operating process as “quite simple”. According to him, as the system’s launcher directs a laser beam at the target, the missile’s target seeking device ‘sees’ it and hits the target, following the laser beam. “The missile launcher is equipped not only with an infrared thermal imaging camera, but also with an automatic target tracking system, which independently keeps the target in the laser beam until it will be destroyed,” he said. Kornev added that due to its very high speed and the precision of the Kornet-EM’s laser illumination system, as well as a Kornet-EM missile moving at a speed of more than 320 meters per second, the Kornet-EM is capable of destroying not only a tank, but also high-speed combat helicopters and drones, which are characterized by high maneuverability. “The Kornet-EM’s technical ideology is simple enough and pertains to a very ‘smart’ launcher and a ‘stupid’ but powerful and high-speed missile. This solution is characteristic of the scientific school of Academician Arkady Shipunov, founder of the Tula Instrument Design Bureau,” he said. He was echoed by Andrey Frolov, chief editor of Eksport Vooruzheny (Arms Export) journal, who was quoted by Izvestia as saying that the Kornet-EM’s armament includes a spate of rockets with anti-armor, explosive and thermobaric warheads, something that he said will help the Kornet-EM cope with a wide range of tasks. Isvesuia also recalled that export versions of the Russian anti-tank missile systems of the previous generation have already taken part in the hostilities.Earlier, the Yemeni TV channel Al-Masirah showed several videos of the Yemeni Armed Forces’ attacks on Saudi military positions. During the attacks, a Russian anti-tank system destroyed several military vehicles, including an M1A2 Abrams, touted as one of the most protected tanks in the world.